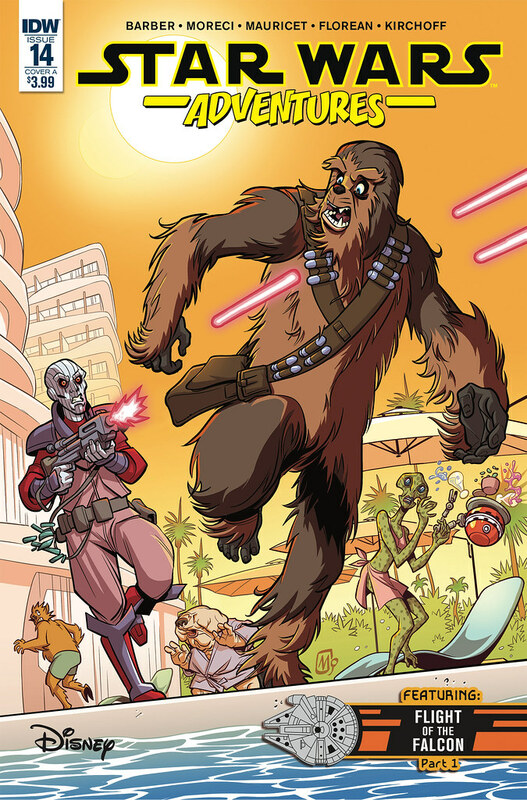 Star Wars Adventures #14 does kind of a tie-in story for Solo with “Chewie’s Day Off” then kicks off the Flight of the Falcon series with “Spy Games.” The artwork in both is good with bright colors, and cartoony but well depicted characters. The stories, however, leave a little to be desired. In “Chewie’s Day Off”, Han and Chewie go to a planet to do a deal, and Han tell’s Chewie to go take some time to relax. Trouble jumps in and action ensues, which isn’t a bad story all in all. The problem is that Han is the only character in the story who speaks basic. Everyone else speaks in an indecipherable alien language. Now I understand having Chewbacca talk in his language, but having the all the other characters do it too seemed excessive. There’s all kinds of words being said, but none of it is translated. It’s a really weird choice, and it hurts the story a lot. “Spy Games” had some potential in that is starts with a framing story between Bazine and IG-88. Bazine is looking for the Falcon and she’s hoping IG-88 can help her out. So IG-88 tells her a story of how he found the Falcon one time while working with the Empire. In fact, he was working with Agent Kallus at the time. Teaming up Kallus and IG-88 is a great idea. The problem is that the little mission they go on doesn’t have much set up. We don’t know how IG-88 found Han. We don’t know why Han and Chewie were on the planet and seemingly waiting for the Empire to show up. We also don’t know what was in the crates they were throwing around. On top of all of that, we don’t know why Bazine wants to find the Falcon. So there’s a lot of unanswered questions. While this is only part one, I’m not sure how many answers we’re going to get in part two. As is, both stories fell a little short. They’re okay, but nothing you have to read. I give this issue a three out of five metal bikinis.